This is the late-afternoon view, looking south out of the 8th floor of the Jewish General Hospital. Spend enough time in this place and eventually your soul needs to look outside. I'm not sure why, but heading to the windows always brightens the moment. This is much the same view I had as a kid when I was a frequent flyer in the now-closed pediatrics ward two storeys down. St. Joseph's Oratory is on the left. St. Mary's Hospital - where our eldest son was born - sits to the right. 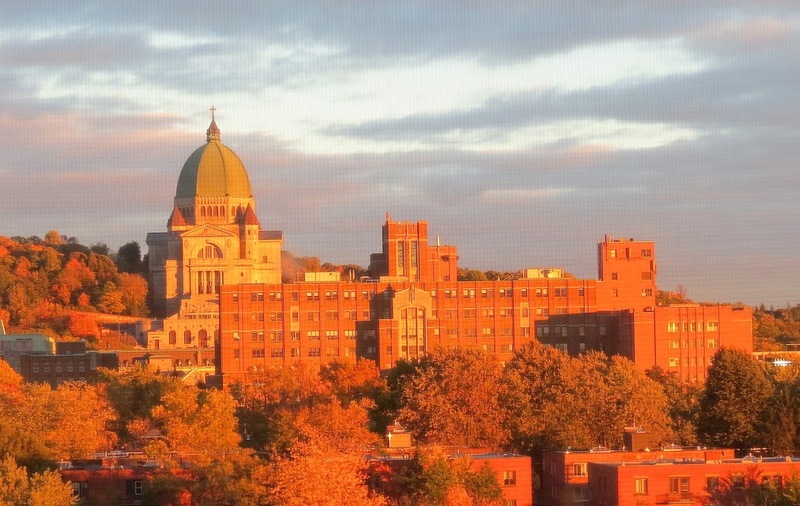 The Snowdon/Cote-des-Neiges neighborhood spills down the Mount Royal slope. Except I didn't have a camera back then, and my only option was to remember the scene in my mind. 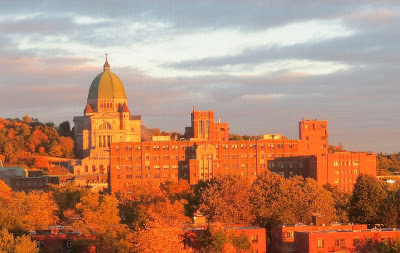 I watched this vista so often, from first light to sunset, and often through the night when the sounds of the hospital kept me awake. It eventually became a scene impossible to forget. Which is why when I happened upon it again, it seemed so familiar. The photo in my camera perfectly matched the one I'd been carrying around in my head all these years. I didn't necessarily want to be back here - indeed, no one ever does - but at least it felt somewhat like home. Inside hospitals is so INSIDE. That is why we want outside views. Oh! I discovered your blog when I lived in Hamilton, Ontario, and then got out of the habit when we moved to a new job, a new life, a new home in ... Montreal. :) I'm sorry that it's a difficult time; but thank you for sharing this lovely pic. Some terrific colour in this view from the hospital window. I'm glad that seeing this memory brightened your day. Hospitals can be hard places to spend time in.